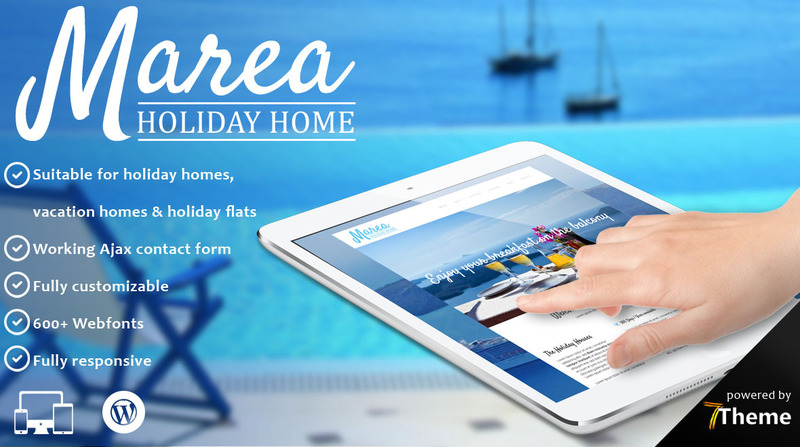 Marea is a premium responsive Wordpress theme created especially for holiday houses, bed and breakfasts, hotels and agritourism. It is very easy to setup and use.This theme comes with loads of great features like Shortcodes, Web fonts, animated content & powerful CSS3 animations. Marea was made to be easy to customize to match your branding from within the WordPress admin area. It is also easy to Upload Your Logo. None of this requires editing code. You can easily switch fonts (600+ Web fonts included) for all text elements using our Options panel. Each font comes with preview, so you can be sure, that you have chosen right. Marea is ready to use from the box. Quickly install it via FTP or WordPress and after you activate it you can load demo content. Then you can add your own content on already designed pages. Marea looks great on all devices like iPhone, iPad or large screen. Quickgalleries - create new page, upload images and choose the "Quickgallery" template and columns, all done! You get free support and updates.